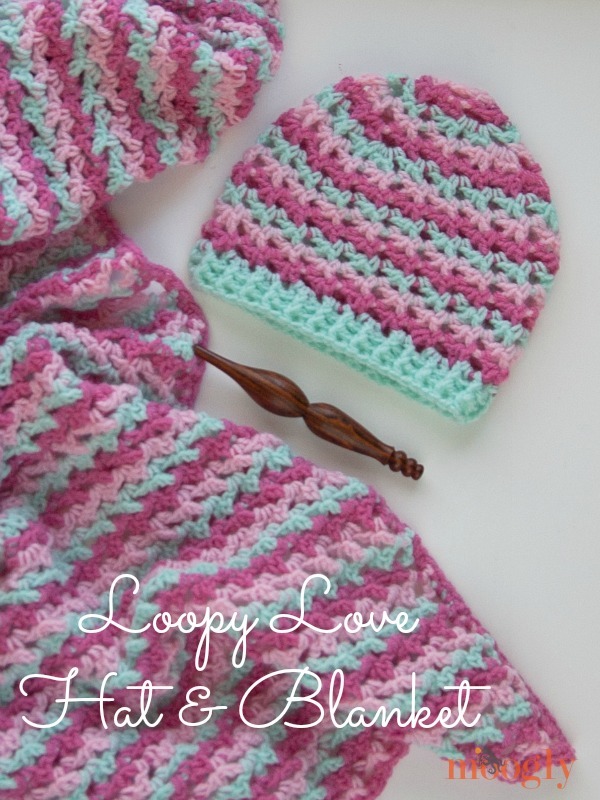 The Loopy Love Hat: Free #Crochet Pattern on Moogly! 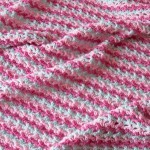 The Loopy Love Blanket was last week’s free crochet pattern, and it includes 7 sizes. 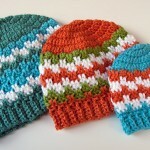 This week I’m sharing the Loopy Love Hat, which comes in 5 sizes to fit newborns to adults! The Loopy Love Hat uses the same stitches as the Loopy Love Blanket, but working in the round without turning – this creates a lovely swirling effect! If you prefer a more exact match then you can turn after joining every round. After making the baby size blanket I had more than enough to make the baby/toddler size hat (though it was cutting it close on the color I used for the blanket edging). So there should be enough left over to make the smaller newborn size hat as well. 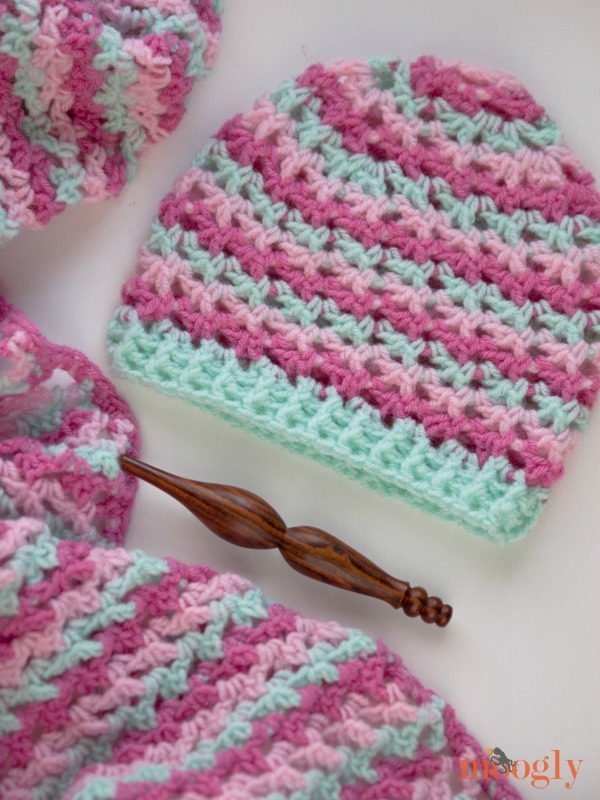 You might be able to squeak out the child size with the leftovers too, as long as you use the blanket edging color as the least used color in the hat. If you’ve got the yardage to spare and prefer a slouchier hat, just add more rows in the section where you’re working evenly! NOTE: To change colors for each round, after finishing the previous round with a slip stitch, pull through and chain 1 with the new color. You’ll be able to carry the yarns up the inside of the hat, without breaking them – the floats will be hidden by the stitching. 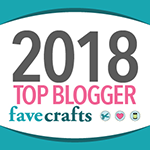 SIZES: Newborn (12-14″); Baby/Toddler (14-17″); Child (17-20″); Teen/Small Adult (20-22″); Large Adult (22-24″) – be sure to scroll down to the instructions for the size you wish to make! Round 15 – 16: (Continuing with smaller hook and same color as previous round.) Ch 2 (does not count as a st), fpdc in first st, bpdc in next st. *Fpdc in next st, bpdc in next st. Repeat from * to end, join with a sl st in top of first fpdc. (46 sts) Break yarn and weave in ends. Round 17 – 18: (Continuing with smaller hook and same color as previous round.) Ch 2 (does not count as a st), fpdc in first st, bpdc in next st. *Fpdc in next st, bpdc in next st. Repeat from * to end, join with a sl st in top of first fpdc. (54 sts) Break yarn and weave in ends. Round 19 – 20: (Continuing with smaller hook and same color as previous round.) Ch 2 (does not count as a st), fpdc in first st, bpdc in next st. *Fpdc in next st, bpdc in next st. Repeat from * to end, join with a sl st in top of first fpdc. (60 sts) Break yarn and weave in ends. Round 21 – 23: (Continuing with smaller hook and same color as previous round.) Ch 2 (does not count as a st), fpdc in first st, bpdc in next st. *Fpdc in next st, bpdc in next st. Repeat from * to end, join with a sl st in top of first fpdc. (64 sts) Break yarn and weave in ends. Round 23 – 25: (Continuing with smaller hook and same color as previous round.) Ch 2 (does not count as a st), fpdc in first st, bpdc in next st. *Fpdc in next st, bpdc in next st. Repeat from * to end, join with a sl st in top of first fpdc. (68 sts) Break yarn and weave in ends. 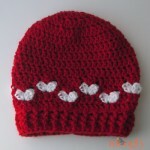 Thank you to Red Heart Yarns for sponsoring the yarn for this hat! Written pattern copyright Tamara Kelly 2014. Please do not reprint or repost this pattern, but please do link to this page to share this pattern with others. 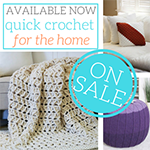 If you wish to make items for sale from this pattern, please visit the About page for details. Hi Tamara! I’m itching to make this baby hat for a 3-months-old girl already! But I only have sock weight yarn with nice colours for it. Do you think I can simply go up a size and follow your pattern straight or I’ll have to breakdown and recalculate the numer of stitches in each round? The number of rounds can be a work-as-I-go. Thanks! Hi Janice! 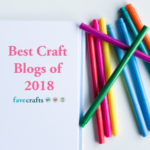 You should be able to go up a size or two – basically, make the diameter about 5 inches across before you start working evenly around, and you should be all set! How tall is the teen/small adult size? 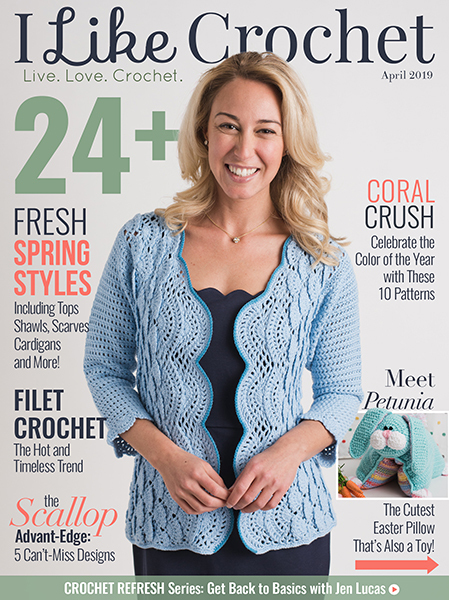 I am loving on that crochet hook in the picture! Where did you get it?! Thank you Camille! It’s a Furls: http://furlscrochet.com/collections/crochet/products/handmade-wood-furls-crochet-hook-alpha-series#oid=1009_5 😀 It’s a joy to use! 😀 I’m so glad Rose! Thank you! Hi Tamara! I just want to ask about “Baby/ Toddler” – what that is mean – like 6-12 months or? I’m not sure. i prefer to use 4 weight yarn, how does that change the pattern? Dear Tamara, you can delete my previous question – i’v read carefully your instructions and understand – i make this wonderful hat! Thank you. 😀 I’m so glad! Thank you! I love this pattern. 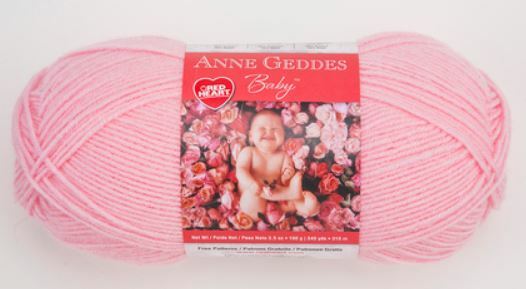 I would love to make it for myself in an adult size but I would like to use an amazing hand dyed sock yarn that I have. Its a super wash merino sock yarn… What would be your suggestion for this? Should I increase any particular row to make sure it fits me? This is a good school/team colors pattern! I made this hat and a scarf from the Loopy Love Blanket pattern with the New Orleans Saints colors of black, old gold and white. Also made a two-color one with school colors of green and gold. 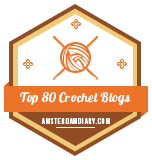 😀 Thanks so much Pat – and thanks for sharing the tips for worsted!! I love Moogly. If you knew how much I loved your site… It might be considered scary. Thanks for having such a wonderful site. Hehheh 😀 Thanks so much Aleta! Love this hat! Have made several. But for the Newborn hat, you need to put one extra dc in Round 14 in order to come out with 46 sts total at the end of the round. Following the instructions for Round 14 as is only gives you 45 sts total. There needs to be 46 so that the last two rounds of alternating fpdc and bpdc come out right. It is somewhat triangular at the start, yes! Using a stitch marker to mark your first st of each row can be a big help! I LOVE THE LOOKS OF THIS & started, but got tangled up with all the yarns. CAn you explain how to carry up the floats? I did this with another hat no problem, but this has got me stymied. You do have to move the skeins around a bit to keep the yarns from tangling. If it gets to crazy, you can always cut them too! Will you maybe come up with a matching baby sweater and little shoes? when i completed this hat it had a point on top. i went EXACTLY by the pattern. What happened? Hi Tracie! It could be a tension issue. You could try lightly blocking it with water to reduce the pointiness! 😀 I’m glad to hear it! Thank you! Hi Isabelle! 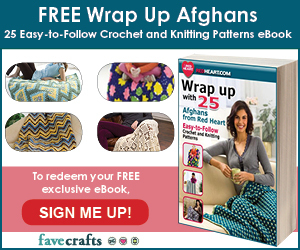 There is a tutorial for the stitch pattern, what part were you having trouble with? thanks for this pattern! I made it for myself as a slouch hat with a thin yarn, just used a crochet hat sizing guide to make sure it fit. i used a 3.75 mm hook for yarn that called for a 3-3.5mm to get a lacier effect and went for as many rows as necessary to get it to be longer and slouchy ( i didn’t count, just tried it on occasionally, then went down to a 3mm hook for the brim. thanks again, i love my new bright mustard hat! 😀 I’m so glad to hear it, thank you! How long does the small adult take to make? I am struggling with the joining of the rounds . It says to join with slip stitch to the ch-3, however, there is a sc that must be skipped over to do this, or am I reading it wrong? Thank you so much for your patterns. I love them. Every one that I’ve made has come out great. I’ve made a least half of dozen Luscious One Skein hats, as well as matching scarves, boot cuffs and gloves. I just made a Loopy Love hat today and it’s so cute! Thanks again for sharing your patterns for free!!!! 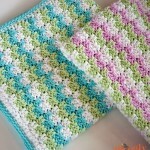 I have been crocheting for years but had never made anything other than simple double-crochet scarves. I told myself I had to branch out, and this was my first attempt at deciphering a pattern. I was nervous and had to look up most of the abbreviations, but to my supriprise, the hat came out beautifully! This was a lot of fun and I learned so much. The stitch count at the end of each step was a phenomenal help. Thank you so much! Hello Suzie! Yay! Oh I’m so glad to hear it! 😀 Thank you! Hi this might be a silly question but just finishing new born hat and it says round 15-16 is fpdc and bpdc. Do i do 2 rounds of this or one? As it says round 15-16. Thanks so much. Hi Fran! You do two rounds that are exactly the same. 🙂 So the fpdc sts should line up on top of each other, and same with the bpdc sts. Mil gracias Tamara por compartir tus creaciones, admiro mucho tus tejidos. Me encanta el crochet, es mi pasión, es mi terapia.